Hooked on Krafts: Not Long now only one more sleep !!!! Well its not long now until the show on Create and Craft from Crafters Companion of the new Embossalicious and Darice embossing folders and Die'sire dies. These are stunning and I was so lucky to have had the chance to work with these first. I am posting two projects today as I did not blog one that I put onto Facebook the other day, I know how rude :). The box is a Bon Bon box and I have made 4 small butterfly boxes to hold sweet's and some other treats, I had so much fun making this.hope you like them and thanks for stopping by. 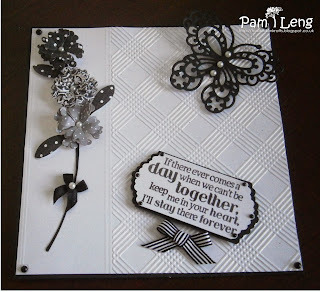 Picnic Plaid Embossing folder, Die Sire Sentimentals Memories are Made stamps, Blissful and Lace Die Sire Flower Dies, Ultimate Pro, Black and White card and White Centura Pearl. Absolutely fabulous collection Pam, lovely designs and fabulous detail.